The classic beauty and amazing qualities of poly make it one of our top sellers! Poly material is a composite of recycled materials making it extremely durable and environmentally friendly. Elegant design makes this a striking outdoor piece. 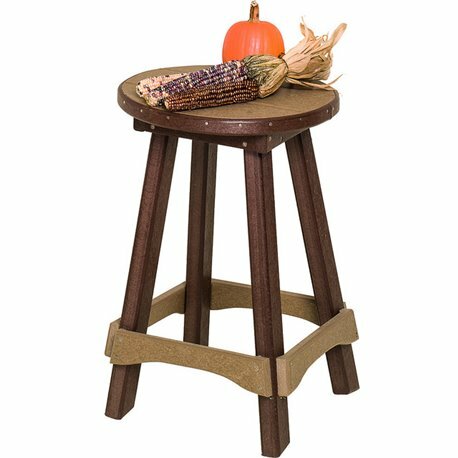 Made in the USA by Pennsylvania Amish, we have constructed this with durability and strength in mind. Classic design and cozy comfort characterize this item. It will be a family favorite all season long! Please don't hesitate to contact us regarding questions about color combinations or anything you need. 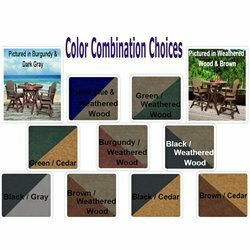 First image shows weathered wood primary color with brown trim option. 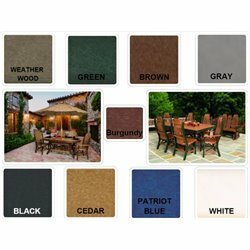 Please refer to secondary images for color swatches. Your family will enjoy relaxing with this comfortable, sturdy, and durable furniture for years to come! Pairs great with our balcony tables. Maintenance free - will not warp, splinter, crack or decay. Never need to paint - poly lumber is solid color throughout. UV resistant. Impervious to insects. Temperature change resistant. Environmentally-friendly poly lumber is made using 90% recycled materials. All custom made by the Amish. Basic assembly required. Proudly made in the USA! Dimensions: Seat Height: 24", Seat Diameter: 17". Important Note: FREE SHIPPING! This item ships ground via UPS or Fed-Ex. Please allow 10 days for construction before shipping.